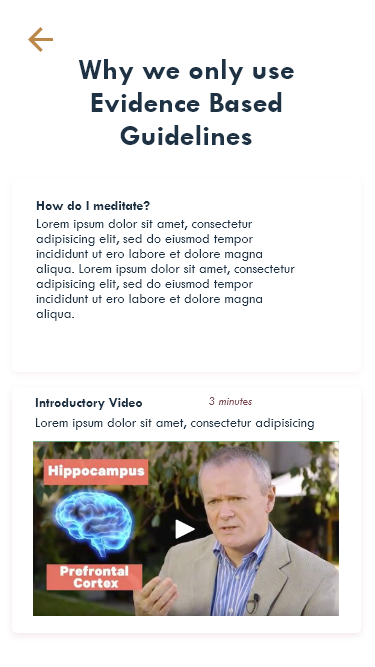 In May 2018 I completed a project-based learning experience via Harness Projects, working as a UX Designer for Smiling Mind. 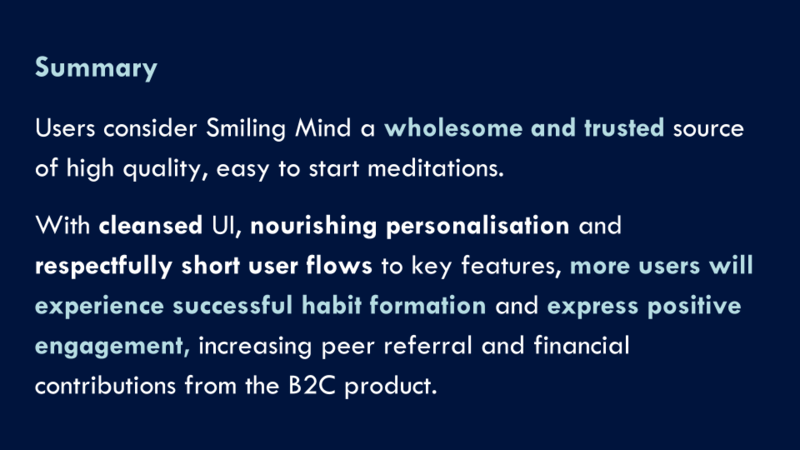 In this role I applied human centered design and design thinking principles on a project brief centered on improving the user experience of the Smiling Mind mobile app. I collaborated with Melissa Cupples, Head of Product and Strategy at Smiling Mind and mentor Lisa Huck. 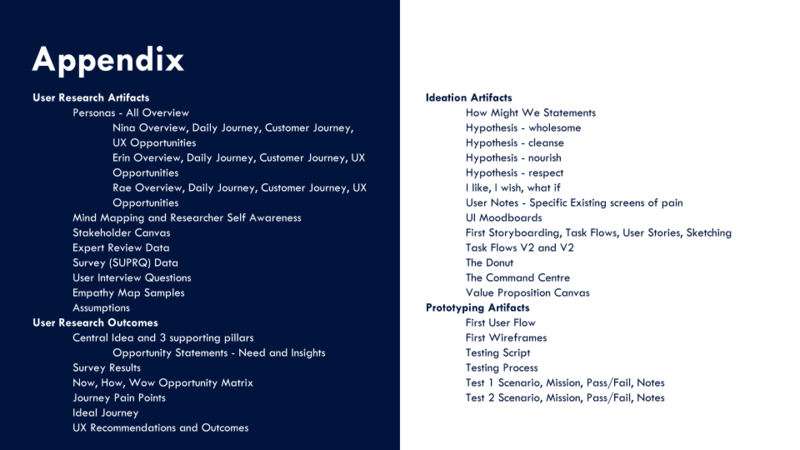 Allocating 8-16 hours a week to the project, I presented my UX recommendations after 8 weeks. To comply with my confidentiality agreement I have omitted and appropriated confidential information. All images are my own unless otherwise noted. An iterative application of design thinking principles; Use empathy to ensure you're designing the right thing, and ideation and prototyping to ensure you're designing things right. This model is my adaptation of the double diamond refined over the years. Through stakeholder interviews, I was able to gain a better understanding of the current situation - reported poor existing user retention. Smiling Mind were aware of users dropping off after 1 session or less than 1 week after downloading, but didn't have research that specifically outlined the pain points that caused this behaviour to occur. 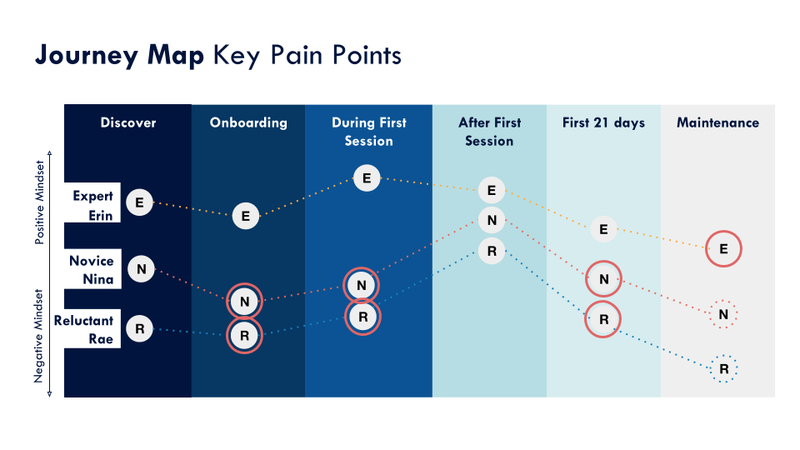 Identifying these pain points and specific improvements to retain users became the main goal of the project. Additionally, as a not for profit, they were looking for new ways to add and capture value to maintain the free public app and ensure financial sustainability in the longer term. 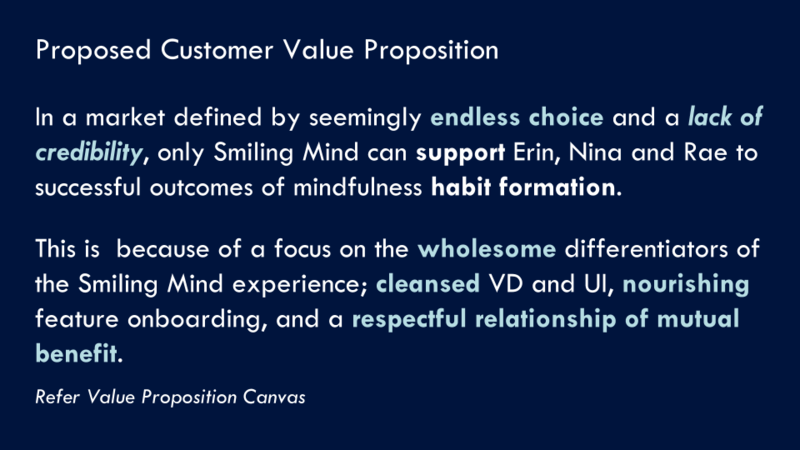 Purpose: To gain deeper empathy for Smiling Mind’s key customer segments(s) – to document specific pains and gains in existing user journey as a guide to identify opportunities for optimising the end-to-end customer experience. Practice: Qualitative and quantitative research including; existing user interviews, contextual inquiries and survey in the key adult segment; Australian women aged 24-44 years. 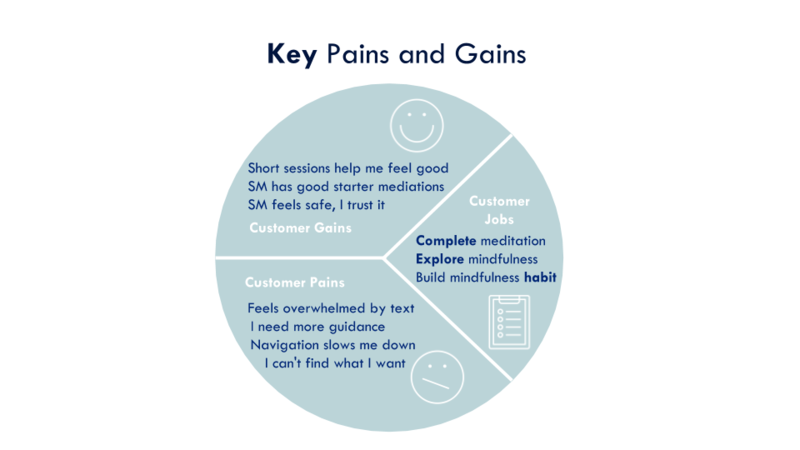 At the end of this stage I identified 3 key personas representing the user's need for support from the Smiling Mind app; the Expert, the Novice and the Reluctant mediator. "I like the app, but I don't know where to focus"
"I love that Smiling Mind supports my practice"
The existing experience will be strengthened by refocusing on the wholesome differentiators of the Smiling Mind app; cleansed visual design and user interface flows, nourishing feature onboarding, and a respectful relationship of mutual benefit between user and not for profit organisation. With the user's pains and dream gains synthesised, I looked outward again for inspiration and best practice. 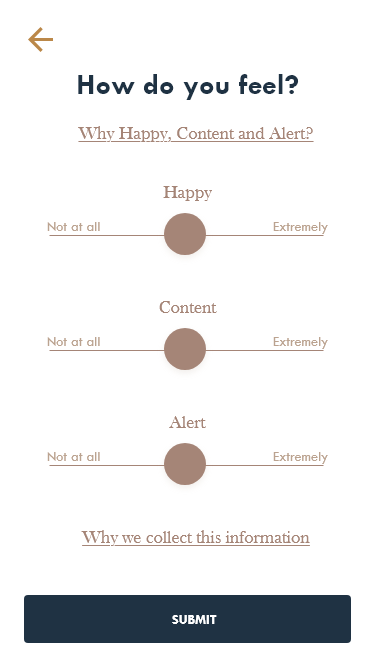 In this case that meant comparing two research streams; other meditation apps (in particular market leaders) and more broadly, leading wellness industry brands. 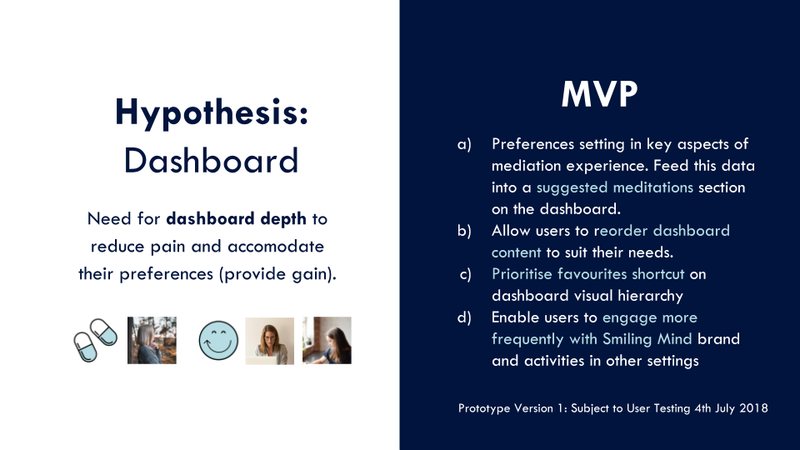 Collecting and analysing visual and user flow data from both streams, I was able to benchmark the kinds of best practices that Smiling Mind's user base had come to expect. The next step was to mesh those industry-leading practices with Smiling Mind's not-for-profit reality. Frequent and long term users had told me again and again that they loved the brand, and the work Smiling Mind did in schools. They wanted to support Smiling Mind's ongoing success. They were already loyal but mentioned that being engaged more often or more deeply might increase the frequency with which they were willing to pay (donate) to support Smiling Mind. I began to ideate ways in which to increase brand engagement with with that goodwill, introducing low friction calls to action to donate to Smiling Mind more often. With these parameters set, I commenced iterating the flows through various levels of low fidelity prototypes, testing with existing Smiling Ming users representing the 3 persona's along the way. Next step was to refine the flows and take the wireframes into a series of high fidelity prototypes. 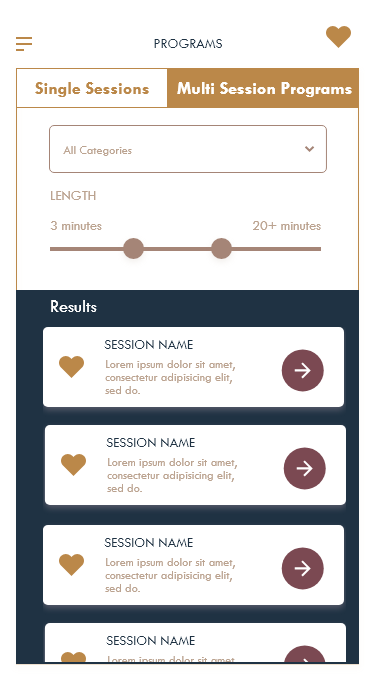 I used Adobe XD in this project. The final step! 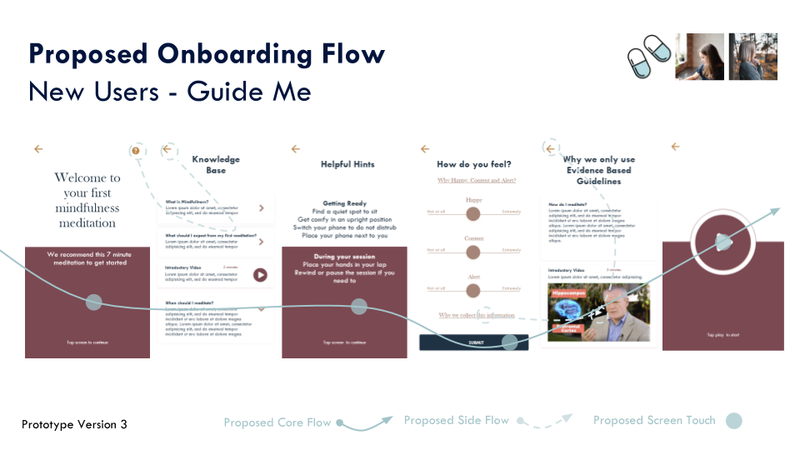 Bringing all the information together into a concise set of recommendations for presentation to Melissa Cupples, Head of Product and Strategy at Smiling Mind. 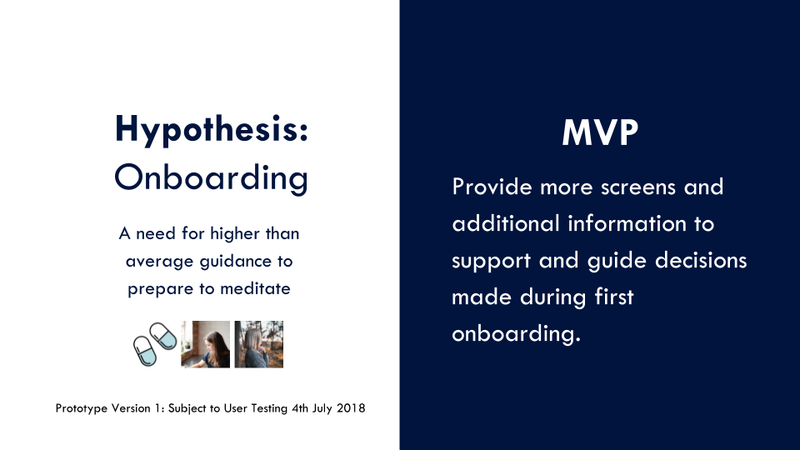 At the end of the 8 week project I received the following summarised feedback from project mentor, Lisa Huck and client, Smiling Mind's Head of Product and Strategy, Melissa Cupples. — Keely Malady is a multidisciplinary designer/thinker/doer who hates referring to herself in the third person.